Chicken Fat: Somebody Shifted the Earth! As I mentioned several times, I have noticed a cluster of Canadian Geese hanging around where an area that has been graded out, new streets paved, and new McMansions are about to go up. Just about every day I notice the geese standing around quacking or squawking or just standing, similar to day laborers. I assume each morning it is a different bunch. I think that is what they do, land as a team, look around for something to eat, rest a little while and take off again on their long trip. Willow and I usually walk by the area every morning about 8:00. Did they spend the night? Probably. And if we go out in the evening I see a bunch in the same place… is that a newly arrived flock? Probably. This is the first year I have noticed the geese hanging around that certain area. And to coincide with that, it is also the first year that a certain pond directly east about two tenths or a quarter mile away is not festered with the geese. I walk by the pond several times a week and I haven’t seen a geese there all season. I wonder if the same geese that normally stop at the pond got something confused and landed on the side of the road? I could understand one flock of geese accidentally doing that, the lead flyer got his bearings confused or something. But a flock day after day? 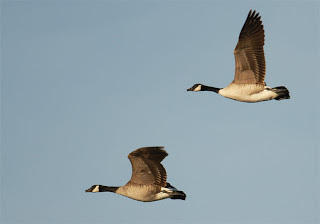 I am wondering if maybe the magnetic pull or whatever guides the lead goose – to give him or her a sense of north and south – has shifted a little, causing about a quarter of a mile miss? You never know what mystifying things Mother Nature is playing with.